Sacramento based conductor Paolo Reyes graduated with his Masters of Music Degree with an emphasis in Orchestral Conducting from Sacramento State under the tutelage of Leo Eylar. Recent engagements include the Lake Tahoe Music Festival in 2015 and 2016 as assistant conductor, where he conducted the first collaborative production with the Tahoe Youth Ballet set to the music of Haydn’s 87th Symphony. With an ever expanding and broad taste in music, Maestro Reyes was also involved in Missouri Street Theatre’s Conductor for their productions of The Little Mermaid and Fiddler on the Roof. Maestro Reyes is also the Music Director and Founder of the Sacramento State Summer Symphony, an academic orchestra that brings current students and alumni of the Sacramento State Orchestra with the aim to showcase the strengths of Sacramento State’s Music program. In addition to being a versatile performer, Maestro Reyes is also a committed educator, having been a teacher in the Sacramento State String Project during his undergraduate and graduate years. In 2015 he became the Music Director of the Camellia Juniors, Camellia Symphony Orchestra’s Youth Orchestra branch. He has also conducted the Camellia Symphony Orchestra’s Free Family Concerts. Reyes is also a Teaching Artist for the Sacramento Youth Symphony’s Overture Program, which brings music into the after-school curriculum in the Sacramento Unified School District. 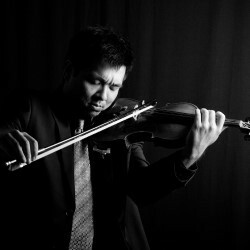 While primarily a conductor, he is also an active violinist, performing in numerous orchestras and ensembles in the Sacramento area including Camerata Capistrano, Camellia Symphony, and the Folsom Symphony.